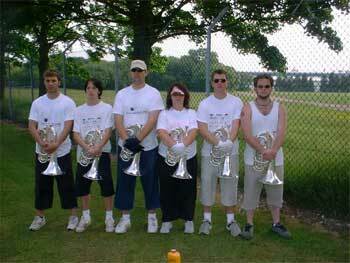 Alex Kennedy of Cadence (from Berkshire, England) says: "This is a picture of the 2003 Cadence baritone line. This was taken in Aldershot (Hampshire) at the first DCUK show of the season. We came second behind the Senators but we took the brass, guard and general effect captions. From left to right, Trev, Beef, Big Stuff, Carol, Wilde and Bert." Thanks Alex! We're running low on Forzato pics! E-mail your submissions -- and we will get to them all, in time -- to dave@dci.org along with where and when the photo was taken. Send some biographical information about yourself as well. We'll give you full credit. Also, let us know if you want your e-mail address included, to get feedback from other drum corps fans.